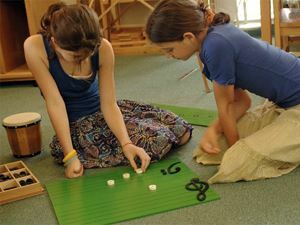 Montessori primary school, in some countries also known as Montessori elementary to distinguish it from traditional school, provides an environment for children between the ages of 6 and 12. Sometimes the children are divided into two groups if 6-9 and 9-12 and sometimes all six years are put together. The child who arrives in the Primary classroom is a different one to the one who entered the Children’s House. He has a mind that thinks and works in a different way. Gone are the days when he just absorbed information without noticing, now he is actively involved in wanting to find things out for himself. In the Children’s House he was interested in ‘what’ things are. Now he wants to know ‘why’ and ‘how’. He has built up the capacity to reason about things, to concentrate on a task and persevere to its conclusion and now he is able to put these skills to good use in finding the answers to all of his questions. In the Children’s House the child developed ways of being with others. He learnt how to respect others time and space and how to work co-operatively with others. Now he is really interested in testing his understanding of this, to find out how this works in real life. The mixed-age community of the Primary classroom facilitates this exploration for him. He works with others in groups for much of his day, sharing responsibilities and allocating tasks on a particular project. The children decide through group discussion what the rules should be for the community. They also decide in the same way what should happen when someone steps outside of these parameters or something is not working. The teacher models a way of resolving conflicts so that when these arise the children are able to find a way of solving them for themselves. They are given the opportunity to test out what makes a community thrive and reject the things that make it difficult to work fairly and productively together. In the same way they get the opportunity to find out for themselves what is ‘right’ and what is ‘wrong’, not by being told these things by the teacher but through testing them out with their peer group and living the consequences for themselves so that their moral compass is developed from within rather than being imposed from above. This is the time where the child no longer needs to hold things in his hands to understand them. He can imagine what something may look like even though it is on the other side of the world, or because it happened long ago in time or it is so small that he cannot see it with the naked eye. In the Montessori primary this imagination is sparked by what is know as the Cosmic Stories. These are stories of truth but told in an imaginative and thought provoking way so that they offer a grand vision of the whole of life. The story of how the world was formed, the story of the coming of life, the story of number and the story of writing are just some of the stories that act as a stimulus that sets the child off down a pathway of exploration that is directed by his own interest. At this time when the child’s intellect is strong and he wants to know the answers to everything we need to find a way to satisfy this thirst for knowledge. The traditional solution is to write a curriculum – a list of what the adult thinks the child should know. But this does not really satisfy the child’s needs because subjects are isolated and are decided by the adult’s interest and not the child’s. In addition, the amount of information that the child needs to be ‘filled up’ with can be overwhelming for both the child and the teacher! Children need to start on their long quest for knowledge by starting with the things that they are most interested in and this cannot be dictated by the adult idea of what they should know. In the same way that in the Children's House they were able to follow their own developmental interests now we must let them follow their conscious interests. 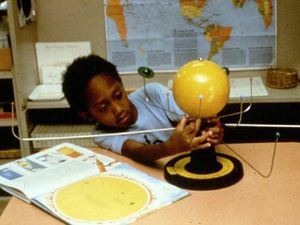 The Montessori solution is called Cosmic Education. Having listened to the Cosmic Stories the child can then start to explore something that sparks his interest and the teacher gives additional lessons with other key materials to support this interest. 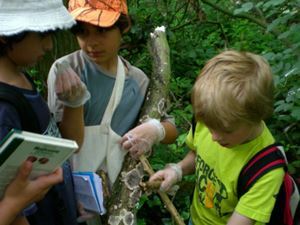 The real learning starts to take place as the child works by himself or with a group of other children, moving from one subject area to another as he seeks to fill out the detail to the framework that has been laid out with the ‘big picture’ envisioned by the Cosmic Stories. The child who starts off by researching the life cycle of a locust might become interested in where the locust lives and how he flies. He is led from zoology into geography and then into physics without even realising it and yet his new knowledge is still part of an interconnected whole framework of the world and the universe. If the child is to find out about the whole world and indeed the universe, it is clear that this information cannot all reside in the stories, the materials and the books in his classroom. So ‘going out’, as it is called, is an important part of the Montessori Primary child’s life. But this is not the kind of school trip that happens in traditional schools where the teacher decides what to go and see and everyone goes whether they have an interest in the chosen topic or not. In a Montessori primary class children organise their trips for themselves. The stimulus for the trip must always come from something they want to find out about as part of their current research project perhaps. The children must organise the trip for themselves, finding out where to go to find out what they need to know, how to get there, how much it will cost to get there and to get in, how long it will take to get there and what food and drink they will need to sustain them. On the day of the trip they can take an adult with them for security but the adult knows that they are not in control of the trip and if the children run out of money or get on the wrong bus they are not there to bale them out. They must allow the children to make the mistake and learn from it. A common fear for parents is founded around whether they can be sure that children will learn anything at all in a classroom where children are free to follow their own interests and choose what they do. This might be valid if it were not for the fact that each child also has an individual plan they are required to fulfil. Things like mathematics and language are scheduled each week by the teacher who plans individual and group lessons for each child based on their observation of the individual child’s capacities. Children are obliged to take these lessons and to carry out the follow on work that comes from them. The difference to a traditional approach is that they can choose when they do these things. If they want to spend all day Monday doing the things they are required to work on and then leave the rest of the week free for their own exploration then they can do this. If they want to leave all of their least favourite tasks till the end of the week then they can do this too. Different learning styles are acknowledged and each child can spend as long as he needs to master a particular challenge before moving on. 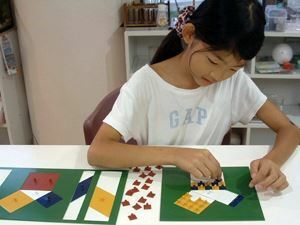 Because children are working on different things they are not all required to make the same progress at the same time. They progress at their own rate and the mixed age range ensures that they do not find themselves in a situation where they are competing with others. 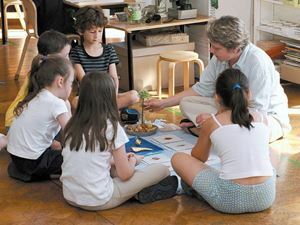 At the end of every week or two each child has a conference with the teacher to discuss their progress and if there are any things that they should have done which they have not they make a plan for completing it – it is not that they will be told what to do by the teacher, instead they will be encouraged to take responsibility for their own actions and this is a skill that will serve them well in adult life. It is true that, in this approach, some children may not learn about King Ethelbert or fruit farming in Fresno in California but honestly, can you even remember who he is or what kind of fruit it was? Wouldn’t you have preferred to be helped to learn how to learn?